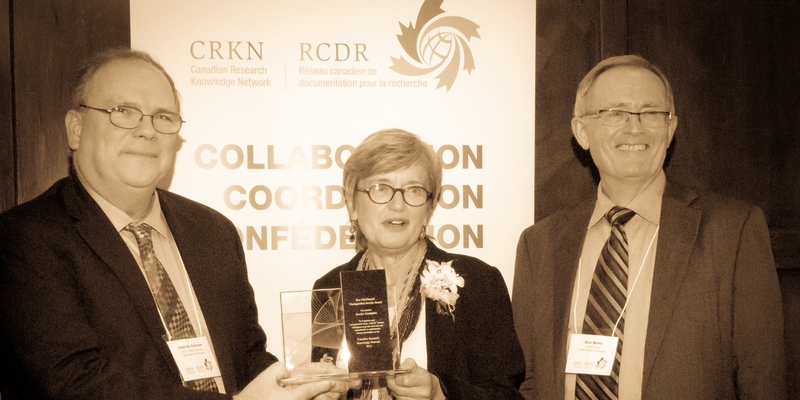 Ottawa – September 9, 2013 – The Canadian Research Knowledge Network (CRKN) is pleased to announce Jocelyn Godolphin as the recipient of the Ron MacDonald Distinguished Service Award for 2013. The award will be presented on October 2, 2013 in Toronto, Ontario as part of CRKN’s Annual General Meeting. The award celebrates Jocelyn Godolphin for her demonstrated vision, leadership, and commitment to advance the goals and the knowledge infrastructure for the benefit of CRKN members. Prior to her retirement in 2013, Jocelyn was Associate University Librarian for Collection Services at Concordia University, with overall responsibility for collection development and management. During nearly a decade in this role, she directed the reorganization of collection services as a response to the unprecedented changes in scholarly publishing. She led the launch of Spectrum, Concordia’s institutional research repository, and was a member of the campus working group, whose initiative ensured the Senate Resolution in April 2010 that made Concordia University the first Canadian university to adopt an institution-wide ‘green’ Open Access mandate. During her tenure at Concordia, Jocelyn was active as a member of the Conférence des recteurs et des principaux des universités du Québec (CREPUQ) Groupe de travail sur le développement concerté des collections des bibliothèques universitaires (DCBU). DCBU guides consortial electronic licensing and encourages other coordinated collection activities for Quebec university libraries. Jocelyn’s role with CRKN started with her participation on the standing committee that is central to CRKN’s programing, the Negotiations Resource Team, for a five year term from 2007 - 2012. She worked in negotiation sub-groups to shape beneficial agreements for members, as well as supporting NRT work to advance licensing principles, increase member engagement, and develop tools for better management of licensed resources. Jocelyn joined the CRKN Cost Sharing Advisory Group in 2012 where she excelled as a resource in supporting the group’s mandate to investigate and make recommendations on consortial license cost sharing. Jocelyn single-handedly conducted a thorough environmental scan of the international context for consortial cost sharing and was a key contributor in crafting the report and final recommendations. Likewise, her substantial input to the Open Access Working Group, a joint initiative between the Canadian Association for Research Libraries (CARL) and CRKN, supported that group’s mandate to collaboratively advance the exploration and promotion of sustainable open access models, and helped produce a final report whose recommendations were fully endorsed by both CRKN and CARL. Jocelyn collaborated with colleagues to present the results of these groups’ work to the membership at CRKN AGMs.